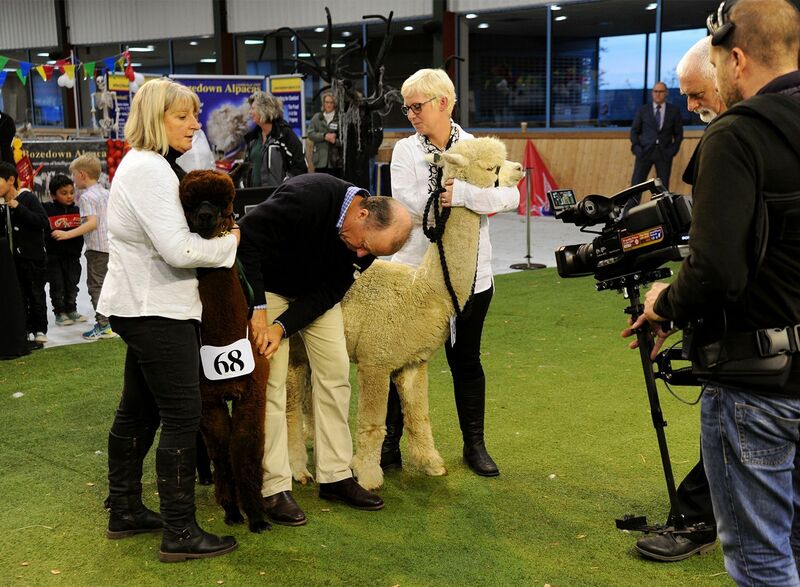 Having decided that I wanted to go down to Cambridge to watch Steve Ridout (Australian Alpaca Association judge) share his wisdom at Showtime 2016, it seemed silly not to take a few alpacas with me in the back of the van (Paul was staying home farm sitting). Thus I entered three intermediate males belonging to us (essentially On The Money and his two pals; The Strategist and Chocks Away) and also took Kingwell Bolero on behalf of our client. 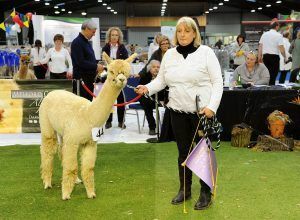 In addition we entered our newly purchased female; Bozedown Delphi, who was my breeders choice from The Alpaca Classic. Delphi was taken to the show with the Bozedown team. One of the big lure’s of Showtime, are the fabulous trophies which are presented to the championship winning alpacas. 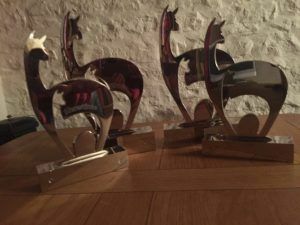 Last year we managed to return home with three; thanks to Prime Suspect taking the Champion Black Male and Trendsetter taking the Champion White Female and Best Female in Show. That meant we were down to the last two in 2015…not much chance of that happening again with our tiny show team, and relying on an intermediate brown male…. Beck Brow Trendsetter (sire: Beck Brow Explorer. Dam Bozedown Celestrial) Best Female in Show 2015. Of course we did have the lovely Delphi representing us and she didn’t disappoint, taking first place in the Intermediate Light Female. With a new format to Showtime, we would be kept in suspense regarding championships until the next day. So we ended day one with 2x 1st places, 2 x 2nd places and 1 x3rd place: On The Money – 1st Intermediate Brown Male (class of 12), The Strategist 2nd Intermediate White Male, and Chocks Away 3rd Intermediate Light male, both in very competitive classes. Kingwell Bolero was 2nd placed Intermediate Black Male. Happy with our little team’s efforts (everyone placed 1st – 3rd) I had a lovely evening with friends, enjoying some good food and wine. Once we got our heads around the running order, I think everyone enjoyed the championships all being held at the end of the second day. This format allowed spectators to witness all of the colours, in both of the breeds within a few hours; and meant a good audience was in attendance to see the major awards presented. Our first success of the second day was with Bozedown Delphi (Sire: Bozedown Achilles) who was awarded Champion Light Female…we were delighted enough with that…but were over the moon when she took the overall Light Champion Huacaya. The judge remarked about the uniformity of micron and beautiful, soft handle, bright fleece on a solid upstanding frame. Thank you Bozedown Alpacas for allowing us to purchase Delphi and for taking her to Showtime on our behalf…Delphi will be delivered to Beck Brow on Saturday, along with three other additions (more when they arrive). Bozedown Delphi (owned and exhibited by Beck Brow) taking Champion Light Female. And the obvious delight when Bozedown Delphi takes overall Light Champion for Beck Brow Alpacas. Next up receiving a Championship was Beck Brow On The Money (sire: Timbertop CT Goldmine of Beck Brow. Dam: Bozedown Campari) who was described as a stand out champion by the judge, who said so many positive things about the quality of his fleece, and his depth of colour…exquisite being one description. This was reiterated when he was awarded overall Champion Brown Huacaya. So it was we returned three trophies…and took home four! Beck Brow On The Money overall Champion Brown Huacaya. The four lovely Alpaca Showtime trophies residing at Beck Brow. How exciting it was to have two alpacas, out of the five colour champions, standing in the supreme line up, far beyond our expectations….however the excitement wasn’t to end there…On The Money very nearly took the Huacaya Supreme Championship….a brown!!!! It was between him and the White Champion (the lovely Bramble Lodge Thornset – sire: Ep Cambridge Courage). 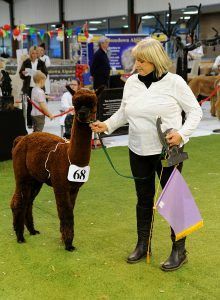 Down to the last two again was so much more than we had anticipated, and we were delighted for Nicola Sly of Bramble Lodge when she was awarded her first Supreme. 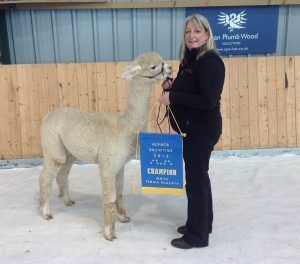 We are so very proud to have bred, what the judge described as… a brown male, who he believed, would stand at championship level at any of the biggest shows in Australia. It’s down to Beck Brow On The Money and the eventual Supreme Champion Bramble Lodge Thornset. 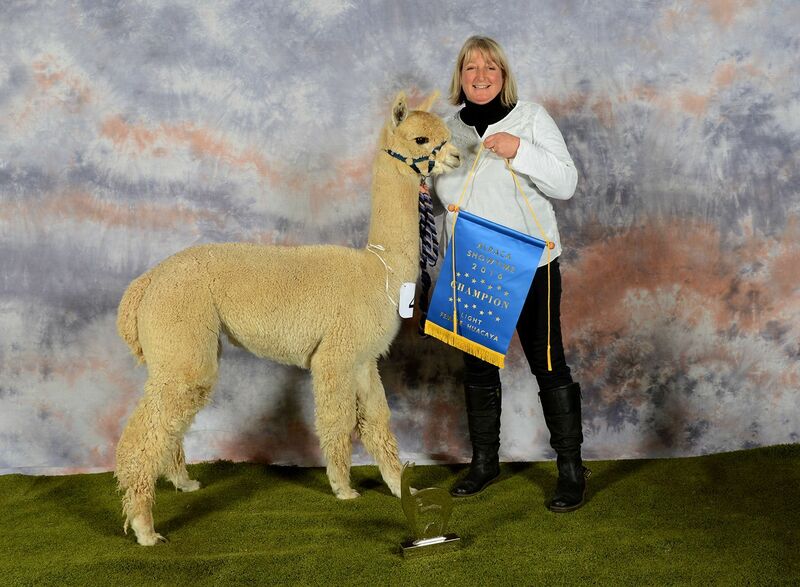 We did rather celebrate on the Saturday evening, and you might think a successful show was a good excuse to purchase another alpaca….however I have had to confess to Paul that the purchase was made within an hour of arriving on the Thursday evening!! So another lovely Suri will be joining Beck Brow (not including Saturday’s deliveries)…what do they say about addictive personality types…more will be revealed at another time. Finally the biggest excitement of all…returning home to our first grandson, a brother for Hettie, being born on Monday evening…Theodore Samuel Kerr! 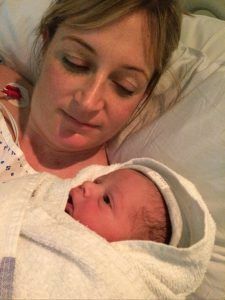 Just minutes old…welcome Theodore Samuel Kerr with daughter Robyn. 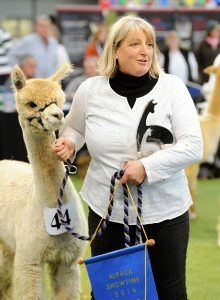 I am trying to contact Nicola Sly who gives talks on Alpaca’s, but unfortunately I have no way of communicating with Nicola. We would like her to speak to our Group Fulbourn Ladies. do you have her email or telephone number please..
Nicola owns Bramble Lodge Alpacas. You should find her via Google.